Do your students struggle with what punctuation to put on the ends of sentences? Mine do! 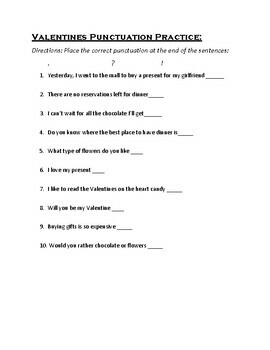 Use this fun Valentine's Day Practice sheet to work on periods, question marks, and exclamation points with students. BONUS: You can discuss Valentine's day roots, traditions, and social etiquette with them.